Select Gazettes from the main menu in the front-end of the web site. The window displays all Gazettes introduced in a specific year . The default year is the current year. Row A - Is the INFORMATION row. It contains details of what is being presented in the window and a text input box displaying the year. The initial view is the current year, but by changing the year by typing in the box and then pressing RETURN or TAB on the keyboard, the legislation presented changes to the entered year. Also at the far right of the window is a HELP icon. Clicking on the icon reveals this HELP screen. Row B - Is the COLUMN HEADINGS row. It contains the column headings for the section D list. The row also contains the names and flags of the languages for the legislation being displayed. NOTE: The site is capable of showing one or two languages. When one language is chosen in the back-end SETTINGS, then the second language column will disappear.To ensure the items are correctly displayed a Category column is included. Row C - Is the LIST TABLE. It contains the list of legislation. Version numbers do not appear as this is the initial release of legislation only. The row identifies the year displayed, allows the year to be changed, and provides assistance with the page. By selecting the year, changing it to the year required and pressing RETURN or TAB, the data for that year is displayed. Gazette Type. The Gazette Type according to local processes. 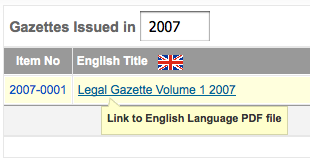 Types are entered via the GAZETTE TYPES screen. Date Issued. 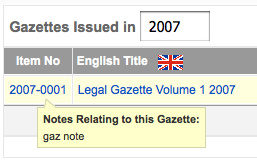 Contains the issue date for the GAZETTE files.